I’ve just returned from Melbourne where, over the weekend, myself and three friends completed the Great Ocean Road Half Marathon. A standard Half Marathon is 21.1km however the Great Ocean Road is actually 23km, plus it’s a very hilly course. The first 17.5km are an up and down adventure with elevation peaks of 80m. There were many times when I wondered if the hills would ever end. I’m happy to report that I finished the Half Marathon in 3:00:08. In just 8 months I’ve come from never running before to completing a half marathon. This is an achievement I’ve very proud of. My goal was to run the whole way and complete it before they kick you off the course at the four hour mark. I started off really strong, feeling good. I wasn’t going to let the fact that my toe fell asleep at the 2km mark deter me. I keep powering on. I was running the race with my best friend, Jordy, who was running at my pace (about 3 mins per km slower than hers – now that’s a real friend). She keep telling me to slow down, so we would make it through the whole race. I ran up all the hills (never stopping to walk as many people were). We were counting down the kms, enjoying the amazing views until about km 15. My body was sore, the hills were plenty full, steep and a killer on the knees. At 16km I wasn’t sure if I could keep going. I was disappointed, devastated. I had to stop running, I couldn’t breathe. My chest was tight. I had worked myself into a mini panic attack. Luckily Jordy told me to calm down and I was able to pull it together. I wasn’t sure if it was due to my aching body or the fact that I had stopped running. During training I knew that if I started walking it was so hard to get back into a rhythm and keep running. For the next few kms we ran, walked, and ran. More walking than I liked but I couldn’t do any more. I was spent, exhausted and felt like my insides would fall out. At the last drink station (about 17km) the winner of the Full Marathon caught up to us. He (Alex Matthews) would go on to complete the full 45 km in 2:32:31. As drained as I was it was a very emotional experience to see him run past and it provided some much needed extra motivation to keep going. 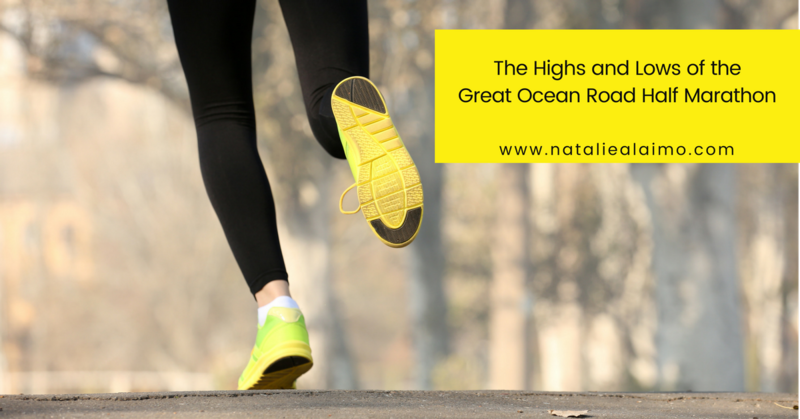 Alex had completed in two previous Great Ocean Road Marathons placing 12th and 4th. Over the last 7km we had trickles of people, who were running the full marathon, catch up with us, each providing more motivation and inspiration. One guy was even nice enough to wish us well on his way past. Finally, we saw the 21km line and started running, wanting to run over the line. I’m not really sure what I felt. I was happy it was over and that I had finished but really disappointed that I hadn’t run the whole way, which was my goal. Could I have done more training? Probably. Would it have made any difference? Maybe. To me running it more of a mental game. And I don’t think any amount of training could have prepared me for what I was going to do at Great Ocean Road. When looking at the course I had mis-read the map, thinking there were only 3 hills, but in reality there were at least 7, very hard, long, steep hills. The Gold Coast Half Marathon is known as a fast flat course with the fastest runners finishing in just over an hour, however the fastest at Great Ocean Road is 1:16. It’s not an easy course and in hindsight probably not the best for my first major run. So, after we crossed the line at 21km we saw another line, which of course we had to run to. Later we realised that was the end of the full marathon. The final 2km (to the actual finish line) was just walking. Trying to recover. And honestly it was the longest 2km of my life. As we got closer to town, we saw the crowds and started running again. It was only the cheers of support that allowed me to keep going. It was an amazing feeling having hundreds of people you don’t know telling you how well you are going, and to keep running, well done. 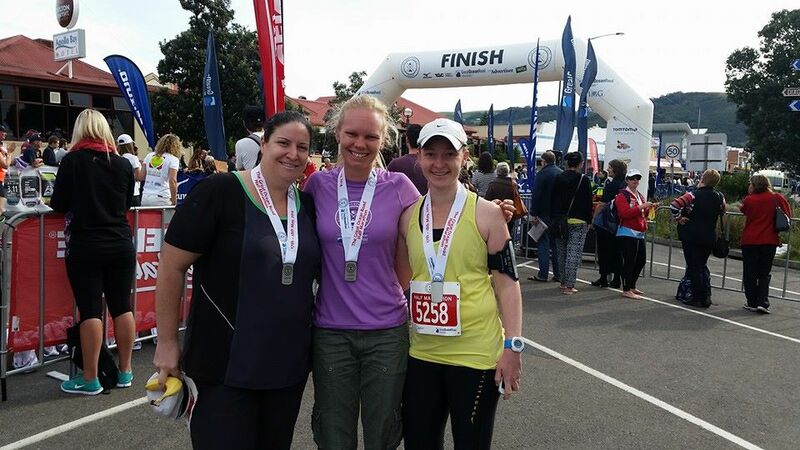 We ran over the final line and had completed the Great Ocean Road Half Marathon. The final time for the 23km was 3:22:02. Like I said a very slow last 2km. So now even two days on, I’m not sure how I feel about my Great Ocean Road Half Marathon experience. The pain in my body has mostly gone, but not the pain in my heart. In fact it’s difficult to remember the moments of pain I felt during the run. Don’t they say that about childbirth? Yes, I’m proud of my achievement and my friends are super proud and keep praising me, but I can’t help but feel I failed myself. Which I know is silly, and I honestly believe the reason why I worked myself up into a panic attack. It’s funny really. I don’t really enjoy running; it often hurts, gives me rashes and is never fun running in the dark, compared to tap dancing, which I can’t wait to attend, and genuinely makes me happy. But something pulls me to running. Something keeps me going, and I’m not sure what it is. Runners often talk about it, and I guess that is why they keep running. If you had asked me the day before the half marathon, it was common knowledge that I was quitting running. I’d had enough and didn’t want to do it any more. But now, I’m not sure. The Gold Coast Half Marathon is less than 7 weeks away and I’m thinking about it. Working out in my head if there is enough time for training, do I want to train for it, do I actually want to run it. Will there be time between my hens, wedding and honeymoon? I guess all I can leave you with is – watch this space. I’ve included some other photos over on Facebook.